The holidays were always a very hard time for me emotionally. Being alone on Christmas and New Years Eve was very painful. So painful that sometimes I would arrange to be with someone or with a group of people just so I wouldn’t be alone. That often was more painful than being alone. And on those occasions when I was in a relationship during the holidays it was also painful because there was something missing, somehow I was failing the other person or she was failing me because even though there were moments of Joy and Love, it never felt quite like it “should” feel. After I had been in recovery a few years – in the course of trying to figure out how I set myself up to be a victim with my expectations – I had a very important insight about holidays. I realized that holidays – not just Christmas and New Years Eve but Thanksgiving, Valentines Day, etc. – along with days like anniversaries and my birthday were the times which I judged myself the most. My expectations of what a holiday “should” be, of where I “should” be at a certain age, of how my life “should” look at this particular time, were causing me to unmercifully beat myself up. I was buying into the disease voice which was telling me that I was a loser and a failure (or going to the other extreme and blaming someone else for my feelings.) I was giving power to the toxic shame that told me that I was unworthy and unlovable. I realized that I was judging myself against standards that weren’t real, against expectations that were a fantasy, a fairy tale. The fairy tale that everyone should be happy and cheerful during the Christmas holidays is ridiculous just like the myth of happily-ever-after is a false belief that doesn’t apply to this level of existence. The holidays are just like every other day of the year only magnified. That means there will be moments of happiness and Joy but there will also be moments of sadness and hurt. Christmas is about Love and birth – rebirth. The Winter Solstice is the time of the longest darkness and marks the point of increasing light, the new beginning. Hanukkah is a celebration of, and time of, rededication. Kwanzaa is a time of recommitment. These are all times of both celebration and introspection. Of assessing the past and focusing on what we want to create in the future (New Years resolutions.) Any new beginning, any birth or rebirth is a also an ending. With every ending there is sadness, feelings of loss and grief. Loss because of Loved ones who are no longer in our life, grief because Loved ones who are still in our life cannot see us or understand us, sadness because of things that ended and people we have had to let go of during the past year. What is so important, what has changed my experience of these Holidays completely is allowing myself to accept the reality of my life (looking at both the half of the glass that is full as well as the empty part) and be wherever I need to be emotionally – that is, allowing myself to be emotionally honest with myself. That does not mean that I have to be emotionally honest with other people. If I am feeling grief because I am alone on the Holiday it does not serve me to share that with someone who is not being emotionally honest – someone who will shame me for not being cheerful. If I am feeling hurt or scared or angry I will only share that with someone who is a safe person to share with emotionally – that is, they won’t discount and invalidate my feelings or try to fix me. I don’t have to live up to some false expectations about how I “should” be feeling today. It was trying to deny the pain and sadness, the anger and fear, while judging myself as shameful for not feeling what I “should” feel or being who I “should” be, that caused me to get depressed and suicidal. When I am in my feeling process I actually am a lot happier and feel more Joy than I ever did before I learned how to be emotionally honest. It was on Christmas about 25 years ago that I got real clear that I could feel more than one feeling at once. I was sad that it was Christmas and I was alone, and I was grieving for all of the Christmases that I had been sad and alone – which were very valid and legitimate feelings. But as I went around to various clubhouses and friend’s homes that were having open houses, I could feel happy to see people I cared about. I could feel Joy and gratitude that I was in recovery and feeling my feelings at the same time I was owning the sadness of that day and the grief of all the lonely holidays that I had experienced. It is so very important to stop judging ourselves against someone else’s standards and shaming ourselves due to a fantasy of where we “should be.” We are exactly where we are supposed to be. We are Spiritual Beings having a human experience. We are perfect in our Spiritual Essence, we are perfectly where we are supposed to be on our Spiritual path and from a human perspective we will never do human perfectly. A natural normal part of our human experience is feeling the feelings – we need to accept that. No one who is being emotionally honest with themselves can go through the holidays without feeling sadness and hurt, anger and fear. The good news is that the more we are able to own those emotions the more moments of peace, Joy, and happiness we can have. Special Holiday Offers – Give the gift of recovery this year by giving some people you care about a personally autographed copy of Robert’s Joyously Inspirational Book. 3 copies of Codependence: The Dance of Wounded Souls for the bargain price of $12 each plus shipping – save almost $18.00 off of retail price. There are also links to special offers for phone counseling, subscriptions, MP3 downloads, and Robert Burney’s Intensive Training Day Workshop on that page. I am reposting this blog for this Thanksgiving Season – and adding a quote here to the beginning of it of something I wrote in one of my Update Newsletters several years ago. ““One of the gifts that came to me early in my healing process was a little expression that helped me start changing my perspective. That expression was, “I don’t have any problems I have opportunities for growth.” The more I stopped focusing on problems and obstacles, and started looking for the gifts, the lessons, attached to them, the easier life became. I became a part of the solution instead of getting stuck being the victim of the problem. I started seeing the half of the glass that was full instead of always focusing on the half that was empty. Every problem is an opportunity for growth. My subconscious Codependent attitudes and perspectives caused me to take life personally – to react emotionally as if life events were being directed at me personally as a punishment for being unworthy, for being a shameful creature. Life is a series of lessons. The more I became aligned with knowing that I was being given gifts to grow from – the less I believed that the purpose of life was to punish me – the easier life became. Since it is Thanksgiving time it seems only appropriate to talk about one of the most important tools in the recovery process – gratitude. Being grateful for what we have, and keeping things in perspective, is vital in the struggle to stay in the now and enjoy today as much as possible. There are two aspects of empowerment that come into play here. One is; that empowerment involves seeing life as it is and making the best of it (instead of being the victim of it not being what it “should” be); the other is realizing that we have a choice about where to focus our mind. To have a healthy, balanced relationship with life we need to see life as it really is – which includes owning and feeling the pain, fear, and anger that is a natural part of living – and then have a Spiritual belief system that helps us to know that everything happens for a reason, that allows us to choose to focus on the silver linings rather than buy into the belief that we are victims. Society teaches us to view life from a perspective of fear, lack, and scarcity. Rather we view life from that place of fear or go to the other extreme and deny that we feel any fear – either way we are giving power to the fear, we are living life in reaction to the fear. Growing up I learned from my male role model that a man never admits he is afraid – at the same time that my role model lived in constant fear the future. To his death my father couldn’t relax and enjoy himself because impending doom is always on the horizon. The disease voice, the critical parent voice, in my head always wants to focus on the negative and expect the worst just like my father did. This programming to focus on the negative was compounded by the fact that I learned conditional love (that I would be rewarded or punished according to what I deserved – which, since I felt unworthy, meant I had good reason to expect doom), and that I had to learn to disassociate from myself in childhood. I had to learn to go unconscious and not be present in my own skin in the moment because emotional honesty was not allowed in my family. All Codependents learn to find things outside of self – drugs, alcohol, food, relationships, career, religion, etc. – to help us stay unconscious to our own emotional reality, but the primary and earliest way almost all of us found to disconnect from our feelings – which exist in our bodies – is to live in our heads. Since I could not be comfortable in my own skin in the now without feeling the feelings, I spent most of my life living in either the past or the future. My mind was almost always focused on regret for past or fear of (or fantasy about) the future. When I did focus on the now it was with self-pity as a victim – of myself (I am stupid, a failure, etc. ), of others (who victimized me), or of life (which was not fair or just ). It was wonderfully liberating in recovery to start learning that I could start to see life in a growth context. That I had a choice to focus on the half of the glass that was full instead of giving power to the disease which always wants to focus on the half that is empty. When I focus on what I have, and have been given, that I am grateful for – instead of just focusing on what I want that I don’t have – it helps me to let go of the victim place my disease wants to promote. What works for me is to remind myself of the difference between my wants and my needs. My Truth is that every day that I have been in recovery all my needs have been filled – and there has not been a single day that all my wants have been met. If I focus on what I want that I don’t have then I feel like a victim and make myself miserable. If I choose to remind myself of what I have and how far I have come then I can let go of some of the victim perspective. Ninety-eight per cent of the time when I am in fear it means that I am in the future. Pulling myself back into the now, turning the future over to my Higher Power, and focusing on gratitude, frees me to have some happy moments today. When I was about two years in recovery there was a time when I was talking to my sponsor on the phone. I had just lost my job, the car had broken down, and I had to move out of my apartment in two weeks. Talk about tragedy and impending doom! I was laying in bed feeling very sorry for myself and very terrified about how painful it was going to be when I became homeless. After listening to me for a while my sponsor asked me, “What’s up above you?” It was a stupid question and I told him so. I was pissed that he wasn’t giving me the sympathy I deserved – but he insisted that I answer. So I finally said, “Well, the ceiling.” And he said, “Oh, so your not homeless tonight are you?” And of course, everything worked out fine in the next two weeks. My Higher Power always has a plan in place even when I can’t see any way out. Robert Burney is a counselor, Spiritual Teacher and pioneer in the area of codependency recovery / inner child healing. His first book Codependence: The Dance of Wounded Souls has been called “one of the truly transformational works of our time.” His work has been compared to John Bradshaw’s “except much more spiritual” and described as “taking inner child healing to a new level” – and he has been referred to as “a metaphysical Stephen Hawking.” Robert’s main site http://Joy2MeU.com/ shares over 200 pages of free original content on codependency recovery, inner child healing, relationship dynamics, alcoholism/addiction, fear of intimacy, Twelve Step Spirituality, New Age Metaphysics, emotional abuse, setting boundaries, grief process, and much more. Reading his book Codependence: The Dance of Wounded Souls (links to all of his books in both hard copy ebook, and audiobook format are on that page) would really help you take your understanding to a whole new level. Understanding codependency is vital in helping us to forgive our self for the dysfunctional ways we have lived our lives – it is not our fault we are codependent. In the last few years he has also published two more books that can be very helpful. 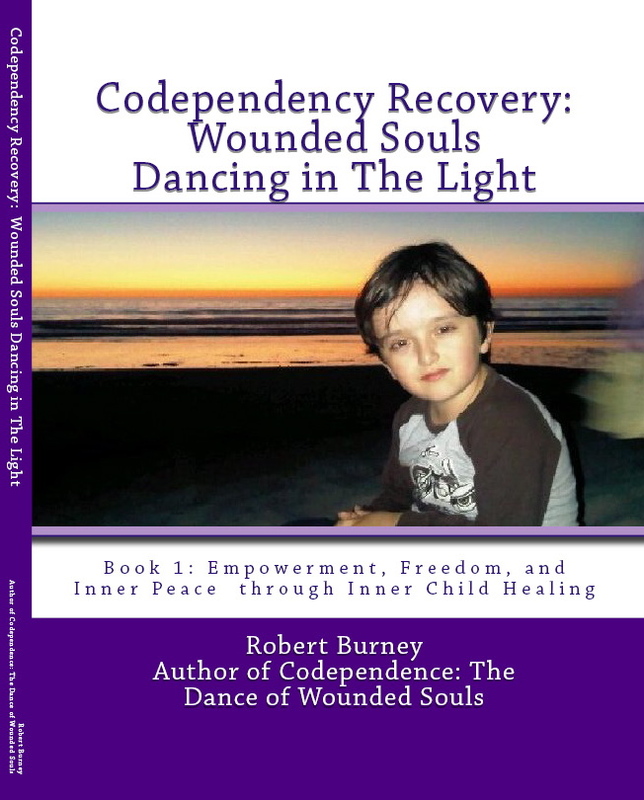 Codependency Recovery: Wounded Souls Dancing in The Light Book 1 Empowerment, Freedom, and Inner Peace through Inner Child Healing and Romantic Relationships ~ The Greatest Arena for Spiritual & Emotional Growth. He has special offers for either or both of these books (or for all three of his books) on this page.